Stone has branched into experimental territory with its Stochasticity Project, and today’s review is a Belgian Quad in the Trappist style brewed with triticale grain called Quadrotriticale. The triticale is a hybrid grain that is added to give the beer the softness of wheat, and the spice of rye. To my palate the result is more wheat than rye, but there is a bit of rye bite in there and it’s nice in any case. The nose has honey and Belgian yeast. The middle is sweet, buttery, bready, with wheat and a hint of rye. The finish is rich, sweet with brown sugar, and there is a touch of astringency from a note of licorice right at the tail. The body is medium to heavy, and the alcohol is a stout 9.3% ABV, but it’s nicely masked. I’d say this is another home run for the Stochasticity Project. This entry was posted in Reviews and tagged Ale, Belgian Ale, Belgian Quad, California, Stone on March 31, 2015 by Xander. For the third and last review of my short series on the Samuel Adams Barrel Room Collection I have a Belgian Quad called Tetravis. The nose has honey and figs, and promises a distinctly Belgian brew. The middle is more of the same, with raisins and currants, mostly sweet, but just a little bit of tartness and some spiciness towards the finish. The finish itself is mellow with smooth vanilla and banana coming to the fore. Right at the end is a distinct note of raspberry. Again this is a big beer (10.2% ABV) that hides the alcohol very, very well. Another really nice beer, making this a fine collection from the Boston Beer Company. This entry was posted in Reviews and tagged Aged Ale, Ale, Belgian Ale, Belgian Quad, Boston Beer Company, Massachusetts, Oak Aged, Quad, Samuel Adams on January 30, 2015 by Xander. 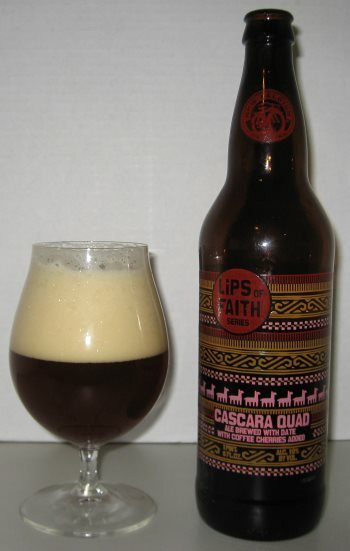 A Belgian Quad from New Belgium Brewing’s Lips of Faith series, Cascara Quad has a number of interesting additions including dates, cherries, and Cascara tea. The nose is rich with figs, cherries, and leather. The middle is smooth and heavy, with notes of dates, plums, cherries, and brown sugar. There isn’t much new in the finish, just subtle hints of molasses and cloves. There is no bitterness in this beer at all, so fans of big Belgians should be fans. The yeast is also subdued, so there’s no particular funkiness here, as you often find in Belgians. This is a very nice, well executed American rendition of the Belgian Quad. This entry was posted in Reviews and tagged Belgian Quad, Colorado, New Belgium, Quad on July 23, 2013 by Xander. 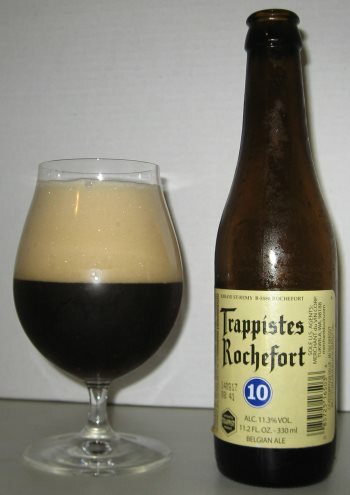 Trappistes Rochefort 10 is both a certified authentic Trappist ale, and an fine example of a big Belgian Quad. At 11.3% ABV this beer is potent enough to be cellar-able, and the rich, blended flavors lead me to believe that it already has a bit of age on it. The nose is yeasty, sour with fruity notes. The middle is heavy, and thick with sweet cherries, oak, and vanilla. The finish is spicy, with a hint of booze and another of banana. This is a fine, well executed example of the Belgian Quad style and a excellent late evening drink that would pair wonderfully with dessert or a cigar. This entry was posted in Reviews and tagged Belgian, Belgian Quad on May 14, 2013 by Xander.